Among the scores of unique motifs associated with New Year's in Japan, one of the most charming is that of the treasure ship, or takarabune — usually depicted sailing toward the viewer heavily laden with symbols of prosperity, longevity and happiness. Like, for example, the Seven Gods of Fortune. Recruited into service as a kind of talismanic dream team in the 15th century, the seven lucky gods, or shichifukujin — a distinctively Japanese syncretic assemblage of folk deities borrowed from Shintoism, Buddhism and Taoism — embody the essence of auspiciousness. In the Edo period, however, attention was also paid to the rest of the team: namely, Daikoku (lit., "The Great Black One," holding a mallet, two bales of rice and a huge bag); Bisamonten (with a stupa full of money); Benzaiten, (the sole female, bestowing beauty and wealth; Fukuroku (with the elongated head, accompanied by a crane for long life); Jûrôjin (a deer for a companion, also for longevity); and Hotei (with a hefty bag of treasures, he is the protector of children). 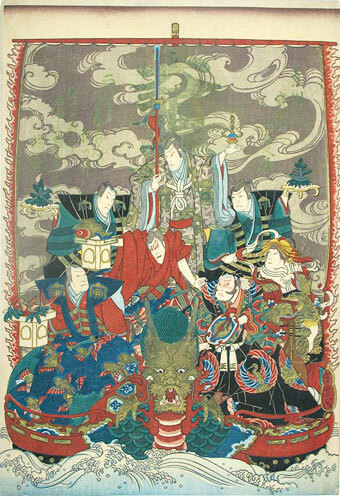 In numerous paintings and craft designs, members of the lucky seven appear individually or crowded together in a variety of settings — including on the deck of a takarabune, a juxtaposition clearly designed to at least double one's good luck. All of which brings us to Fig. 1, a deluxe, over-the-top print by the Osaka artist Gansuitei Yoshitoyo (1830-1866, act. 1854-57). By studying the faces of the seven actors piled aboard the dragon-headed boat in place of the shichifukujin (note the mallet, sea bream and stupa alongside Ichikawa Ebizô V (formerly Danjûrô VII, 1791-1859), Jitsukawa Ensaburô (1813-67), Mimasu Daigorô IV (1798-1859), Ichikawa Ebijûrô IV (1809-58), Onoe Tamizô II (1799-1866), Nakayama Nanshi II (1790-1858) and Nakamura Tomosa), and comparing them with old playbills we can deduce that the print commemorates a 1/1856 Naka Theater performance of Naniwa Soga hana no Kagekiyo, one of a large number of revenge tales built around the story of the Soga Brothers. No Soga Brothers play known today features action on shipboard, but it is the nature of Kabuki to add scenes whenever the situation warrants. Just perhaps, with the second arrival of Admiral Perry and his Black Ships (1854) still very near in memory, the producers felt their audience needed to witness a friendlier port arrival and added a mitate (recontextualized) vignette with beloved actors filling in for the deities. For their part, the print makers eschewed actor ukiyo-e conventions and created a strikingly unusual composition with three poems printed over the sail in metallic ink, plus two huge "great happiness" kanji. Whether the play and print brought luck to the audience is not clear. What can be confirmed is that four of the seven actors were dead within a couple of years, and Yoshitoyo's design — possibly due to the custom of folding New Year's talismen under one's pillow — has hardly fared better. Despite being issued in at least three states, impressions are about as hard to come by as real takarabune. Note: For a non-deluxe version of the Yoshitoyo print, see the website of Boston MFA. This article originally appeared in Daruma, no. 56, Autumn 2007. Copyrighted © text and pictures reprinted with permission.